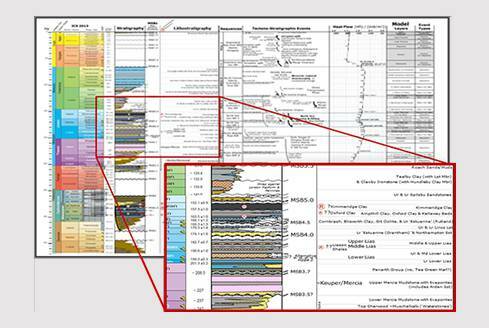 The EPI Geoscience team have a global experience in continuous resource plays and are one of a limited number of non-US consultancies who have been contracted to evaluate shale plays in the USA. Utilising this significant depth of experience, along with our PDFAIRWAY™ methodology and charge modelling expertise, we have developed a new tectonostratigraphic framework for the Carboniferous basins of Northern England which provides a ready-made foundation to help maximise the understanding of UK onshore prospectivity. Sweet-spot maps, combining thermal maturity, reservoir and lithological parameters, which are carefully calibrated against well data. A new Tectonostratigraphic framework, carefully constructed to enable detailed basin modelling and charge de-risking for the prospective Carboniferous basins. Detailed thermal maturity models, generated for key wells, with special care taken to validate and calibrate models against subsurface data to construct accurate and realistic burial histories and heat flows. The results of this analysis are available for purchase in a series of reports for the Edale-Gainsborough, Widmerpool-Needwood, Cheshire-Rossendale, Cleveland-Stainmore, Craven/Bowland and Leeds-Humber basins.